The West Bengal government is in the process of initiating a dialogue with Sikkim government, trying to convince it that giving shelter to Gorkha Janmukti Morcha (GJM) leader Bimal Gurung who had been booked under the Unlawful Activities (Prevention) Act could be a deterrent to the interest of Sikkim. Senior administrative official of the state confirmed of the development. “There is a need to convince the government of Sikkim that if impasse at the hills continues then both tourism and movement of essential commodities would be affected and that peace will only be permanent restored at the hills only after Gurung is handed over to the Bengal government. There is likely to be a talk between the two states by October 24 where these points will be discussed,” the official said. Tourists have given both Darjeeling and Sikkim a miss since the unrest at the hills in June when the indefinite strike began. Tourism is one of the most important revenue earners for both Darjeeling and Sikkim. Things got worse when Sikkim Chief Minister Pawan Kumar Chamling wrote a letter to Union Home Minister Rajnath Singh that the separate state of Gorkhaland which had been the demands of Gorkhas since decades, should be considered. He had also posted the letter on social media. Reacting to that, West Bengal state education minister and TMC leader Partha Chatterjee had severely criticised Chamling saying it was intrusion into the internal affairs of Bengal. 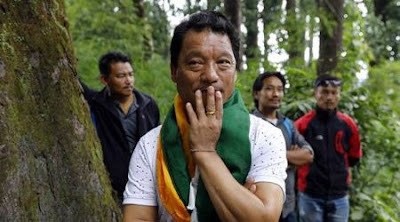 Later CID officials from Bengal made two failed attempts to net Gurung from Sikkim after getting specific information about his hideout and he managed to escape at the last minute. CID officials also alleged that information of the raids could have been leaked through Sikkim Police which assisted in the raids. The first raid was on August 31 at a resort at Namchi in south Sikkim when Gurung was in the process of convening a meeting of the Central Committee of GJM and the second one was on October 7, again at Namchi after which CID officials were told that Gurung had left minutes before they arrived. Earlier Gurung had said through an audio release that he would be coming to Darjeeling on October 30 but on October 13, when Bengal Police raided a hideout at Patlaybas where he was supposedly hiding with his men, there was an exchange of fire and a sub inspector was killed in an exchange of gunfire. Anticipating a renewed unrest at the hills if Gurung resurfaced, GJM leaders such as Binay Tamang and Anit Thapa have planned a meeting at Kurseong on October 29 where Thapa would be present and depending upon how the response of the people is at that meeting another one at Darjeeling would be convened where Tamang would be addressing a public gathering. Police sources said that if Gurung intended to keep his words and appeared at the hills he would try to mobilise at least 1000 people as a protective shield around him. “Every attempt to arrest Gurung would be made if he tried to appear in public,” and official said.